I was recently doing some class history work—looking at past nationals results to get them updated for the website. In looking back through early years’ results, the earliest name I recognized was Bob Bernstein’s, whom I know from racing more recently in last year’s nationals. From 1973 to 2015 is quite a span of participation in the Rhodes class, and I figured there was a good story there—and I sure was right. With the very significant help of Bob’s wife, Joanne, and Bob’s friends, I put together a short sketch of Bob’s adventures over the years. Bob is a class act and one of the Rhodes 19’s class treasures. Bob started sailing back when he was one year old. His family had an old wooden boat named Flight— well, certainly it is very old now, but it is still on the same mooring in Montrose Harbor in Chicago. Bob learned about sailing and racing on that boat. He and his dad won boat of the year at least once, and the boat was sailed in the Mac when Bob was away at summer camp. In about 1973, that boat was sold and Bob bought his first Rhodes, #2000. Bob’s first nationals was in 1973 in New Bedford, Massachusetts. One of his first crew was Scott Graham, who later became a notable naval architect with Eric Schlageter in the firm G&S. During those years, Bob won the Chicago fleet championship several times and competed in several nationals, always placing well. Bob’s friend and competitor Elliott Lyon, who sailed both against and with Bob in the ’70s and ’80s, says Bob was “the smartest guy on the water I could possibly imagine.” Bob would often crew on other boats as well—with a big positive impact on their performance. In Elliott’s last race, with Bob as crew, they clawed their way back from sixth to first in one of those Zenlike moments. Bob’s seamanship is impressive as well; during the 1979 nationals in San Francisco, the hellacious winds and conditions capsized six boats in a single race. Meanwhile, Bob, his rudder having broken off, was able to steer his boat to safety using sails and weight alone. Bob sold his boat in the ’80s and for some years pursued other yachting adventures. In the mid-to-late ’80s, Bob crewed on a friend’s boat out of Jackson Harbor on Chicago’s South Side. One summer the friend was on holiday for a month, so Bob, looking for another boat to sail on, answered an ad from Dorsey Ruley, who had an about-forty-foot racing boat and was looking for a helmsman and tactician. Needless to say, Bob was very curious as to why an owner wanted someone else to sail his boat. Dorsey couldn’t sail the boat himself because he is a quadriplegic. 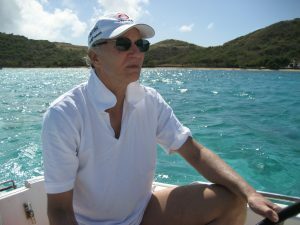 Being out on a sailboat, strapped into a special seat at the back of the boat, is when he really enjoys himself. While in Australia with his wife in 2000, Bob checked out a boat in Sydney for Dorsey, which Dorsey then bought. Bob drove them to first place in the 2002 Mac race and has won boat of the year numerous times. 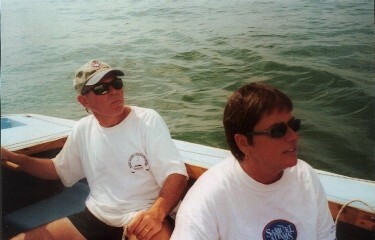 Bob has been sailing with Dorsey for about twenty years now. Meanwhile, Bob really missed small-boat sailing, so Joanne kept encouraging him to buy one again. He said he would do so only if he could find one that was in great shape and competitive. 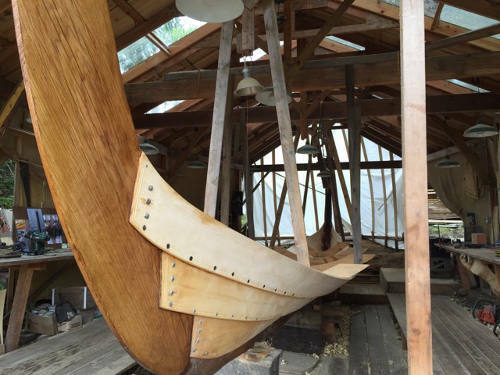 After a year or two, he found his boat; Chris Small in Marblehead had just beautifully refinished it. Bob flew out to see it six or so years ago in about March, and then in late April or early May, Joanne and Bob drove from Chicago to Marblehead to trailer it back. 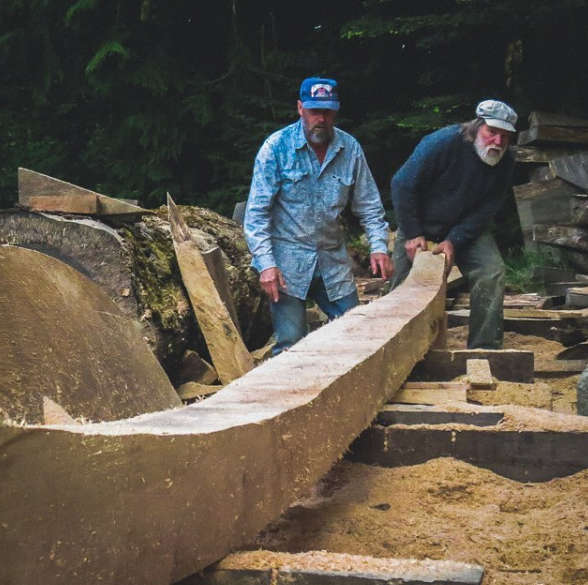 When he was looking to buy a boat, Bob often said that Rhubarb, Bob Jensen’s boat, was the boat to try to beat. Bob Jensen was Bob Bernstein’s legendary competition, and he was an inspiration! Bob was saddened when Bob Jensen retired. When I asked Bob Jensen about Bob, he said he was a worthy competitor and one with a remarkable ability for analyzing and anticipating weather patterns. Bob Jensen always had his eye on Bob’s whereabouts on the racecourse. Upon returning to Fleet 12, he has become one of its most helpful and instructive members. He has run seminars and on-water clinics to upgrade the Chicago fleet’s performance, and he took on chairing the 2016 nationals. Chicago wouldn’t be hosting them if it weren’t for Bob. Also, once or twice a season, usually in the spring, he helps other Rhodes sailors who request his help on a practice day. On those days, he’ll jump from boat to boat and work with three or so boats each day. Professionally, Bob had a seat on the CBOE (Chicago Board of Options Exchange) for about sixteen years. After he left the floor of the exchange, he continued to do some trading from his computer, but he never passes up a doubles tennis game, something he does with about the same intensity as he sails. He plays three to six times a week, less often during sailing season than in the winter. Bob also works part time as a financial adviser. He works independently and likes to look at the whole financial picture of his clients so he can help them holistically. In any event, I’m told that Bob has been a Chicago Corinthian YC member for seventy years. How lucky for the club. A troika can give a group dynamic, productive leadership. One did that for the Class and San Francisco’s Fleet 17 in the ’70’s with Kirk Smith, Jim McCray and Joe Madrigali supplying elbow grease. Now, the other coast has a similar triumvirate at Fleet 35 on Narragansett Bay. Bob Taber is the official lifetime Fleet Captain, and at 83, he delegates a portion of the heavy administrative process and propaganda to Fred Bieberbach and Paul Bestoso so that he can concentrate on what he has done so well for the past 25 years, creating an environment where everyone, young, old, competitive and laid back can meet on an equal, low cost basis to enjoy the water. As Chairman of his Narragansett Terrace Yacht Club’s junior sailing program, which he helped organize and fund, he has introduced as many as 35 youngsters a year into a lifetime sport. He served as prime mover and builder for the club’s White Horse Dinghy frostbite fleet. 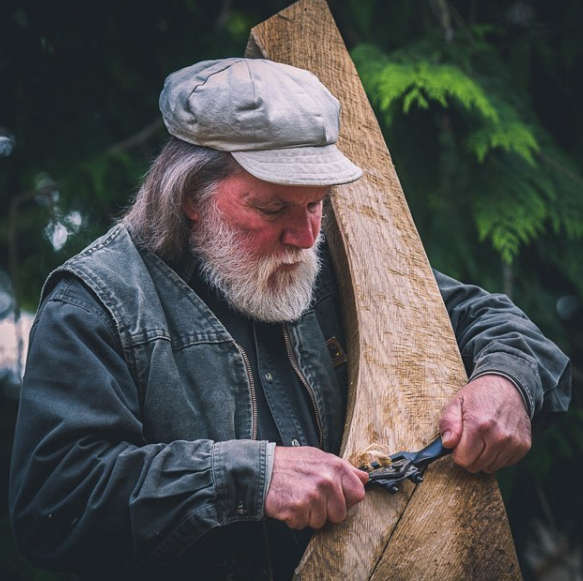 The White Horse, designed by another club regular, Justin Wood, sails every winter Sunday with all ages, including Bob who can still jump in and out of the eight footer. He was instrumental in establishing several special cruising, fun type races to a number of Narragansett Bay locations, at two of which, Comminute Lighthouse and Prudence Island, his club maintains moorings. Bob enjoys a constant hunt for ‘fixer-upper’ Rhodes to add to the fleet. One of the prime conditions for introduction to his finds is that the potential owner agrees to race. Bob’s creed that sailing should occupy every spare moment of one’s idle time was acquired over three quarters of a century on or near the water. With the exception of a WWII hitch in the Navy, keeping B-24s flying in the Pacific, the lifetime has been spent on the upper reaches of Narragansett Bay. At eight, off Pomham Light, in a wooden skiff with a blanket for a sail, he taught himself how to use wind and current to move a boat. Another introduction of this era was the Thompson sub-machine gun, seen by moonlight in the hands of local law men as they supervised the off loading of the region’s prohibition era products. Fortunately for future generations of sailors, no one spotted the awed eight year old as he peered through bushes. Over the ensuing years, he helmed a gamut of craft ranging from RI Governor William H. Vanderbilt’s 72-foot motor yacht through large cruising schooners; various small one designs such as the Rhodes and Newport 24s; hot boats such as trimirans and wind surfers; DN Ice Boats and, finally, the White Horse. He gained the knowledge and elusive touch that have enabled him to maintain a distinctive competitive sailing edge well into his eighties. Competition is just one contribution he makes to sailing. 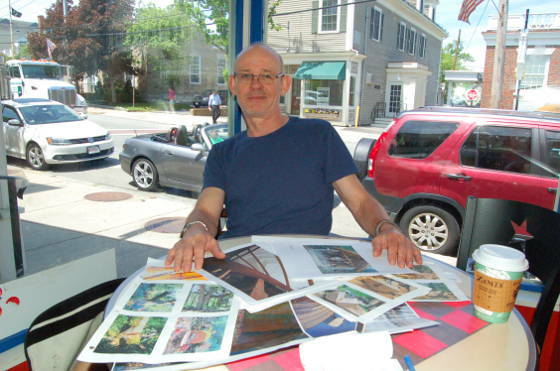 For years, he has acted as a sentinel from his home on a spot looking out on Bullock Cove and upper Narragansett Bay. When spying a boater in trouble, he scrambles into his skiff to lend a hand. His caring concern for others is operable on land as well. A gauge of a man’s esteem is the number and quality of personal anecdotes that his peers circulate about him. The following will give one an accurate reading. Such a treasured Swamp Yankee cannot be evolved by the simple interaction of peers, the service and the sea. A catalyst to forge these into a finished being is needed. 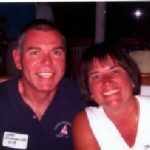 In Bob’s case, she was Alicia, his wife of 51 years, whose loss during a Thursday evening race was chronicled in the Providence Journal. A reprint can be found in the Spring 2001 Mainsheet. 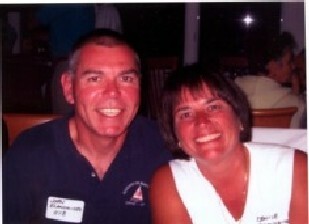 The first woman commodore in Rhode Island, she enjoyed sailing as much as Bob. He feels her absence deeply , but continues the sport they enjoyed together. To abandon it would be disrespectful. So you’re wondering how that mild mannered guy with the winning smile plopped down in our midst and immediately began jumping over the competitive buildings with a single bound. Well friends, Fleet Five members and others, your days of wondering are over. Now it can be told. Fleet Five Captain Steve Uhl has an immense sailing pedigree. His dad, Bill Uhl, with Steve’s mom as crew, cut a swath in the Lightning Class during the 1950s, ‘60s and ‘70s. The highlight of their competitions was a second place at the International Lightning Class Worlds in 1958. Steve was born in 1962 when they were still tearing up the waters of Great Peconic Bay, so there is little doubt that his introduction to the sport was in utero. This is certainly a more comfortable and safe platform than an Opti. We don’t want to trigger an investigation, but the word is that after Steve’s 1962 launching, mom and dad would solve the late or missing third crew problem by strapping in their prize forward of the centerboard trunk where he got his introduction to sail trim, and weaned himself on belaying pins used to secure the Lightning’s halyards. 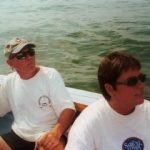 Steve’s earliest memories are of trailing the boat to various regattas around the country to places like Milwaukee, Schenectady, Red Bank, Quantico, Buffalo, etc. from their Port Washington, New York home. 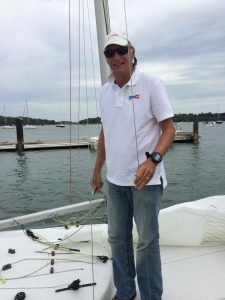 Upon reaching the ripe old age of nine, he found himself in a more formal setting, the junior sailing program at the Cold Springs Harbor Beach Club on Long Island. There, he began his formal training in Blue Jays. At eleven, he won the last Long Island Sound Novice Open Championship in this boat. Subsequently, he moved up to Lasers. If all of the preceding weren’t enough, his sailing touch was further polished when he began flying lessons in 1980. This second hobby continues to the present out of Beverly Airport. At college decision time, there was only one choice, MIT. The academics in Aeronautics and Astronautics were his prime interest, but the real clincher was the sailing program under the inspirational leadership of Hatch Brown. It was great fun to finish classes each weekday at four and then beat it down to the Institute’s Charles River boathouse for two and a half hours of intense sailing competition. Steve’s parents moved to New Hampshire. There, he spent a summer as a sailing coach at Sunapee Yacht Club. After graduating from MIT, he accepted a position with Pratt and Whitney at Hartford, Connecticut where he enjoyed frostbiting in Lasers and a brief stint distance racing. In 1987, he enrolled at Dartmouth’s Amos Tuck business school and after graduating, moved to San Francisco. While establishing himself in consulting work, he let sailing slide. A 1992 opportunity to move back east with his company was a godsend with Marblehead as a magnet. There he met wife Jennifer, a non-sailing college dance professor. Their romance survived a January Interclub Dinghy dunking at Essex, Connecticut and they became parents to two delightful sons,Thornton and Clark who at 7 and 6 are continuing the Uhl sailing tradition by crewing. Steve’s interest in the Rhodes 19 as an affordable, more forgiving, family friendly Marblehead class with an active racing fleet blossomed in 1999. And thanks to Bill and Kera Dalton and Kim Pandapas he found the good ship Woodstock. In addition to his challenging Fleet 5 Captain’s duties of finding and welcoming new members, he is chairing the 2003 National Regatta Committee. For those keeping score, he has endured a 29 year regatta championship drought. So look out for him in August if the rest of the committee can shoulder enough of the Regatta planning load to allow him to think a little about the actual competition.